UCView has one of the fastest growing digital signage platforms available on the market. Power, stability, and cutting-edge features make UCView easy to deploy, maintain, upgrade and work with. Flexibility and extensibility helps keep UCView open to network owners and digital signage users needs which are always poised for change--a necessity in today's digital signage marketplace. Whether you are a small school or a large multi-channel retailer looking to enhance your digital signage presence and increase your communication with your customers and employees, UCView is your premier digital signage platform for growth. These case studies are meant to give you a closer look at examples of customers running UCView in their day-to-day operations. 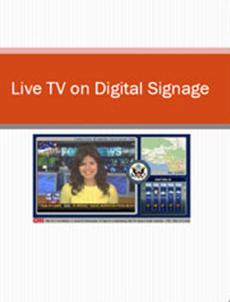 UCView is helping solve real world digital signage needs and requirements. 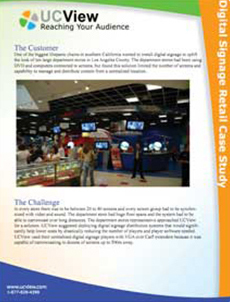 Case studies also provide insight into some unique elements of UCView deployment and customization by network owners, demonstrating how UCView's powerful model can help you grow your digital signage business. 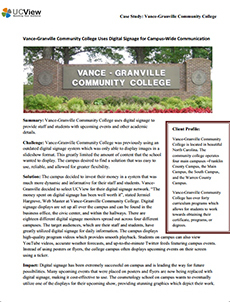 Vance-Granville Community College Uses Digital Signage to Provide Campus Wide Communication Vance-Granville Community College uses digital signage to provide staff and students with upcoming events and other academic details. 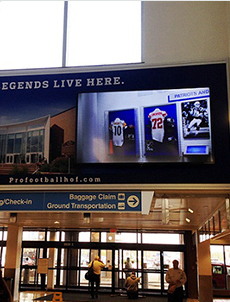 The Pro Football Hall of Fame Uses Digital Signage to Reach Consumers WRL Advertising is a full service agency that provides business, both large and small, with the very latest in website design and programming, multimedia, broadcast, print, branding,traditional, and internet marketing and public relations services. 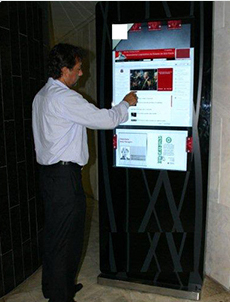 How a private university is using digital signage as a communication tool for students, staff, faculty, and visitors. Pepperdine University is a prestigious university located in beautiful Malibu, California. With a picturesque scenery, this campus provides many opportunities for thousands of students. 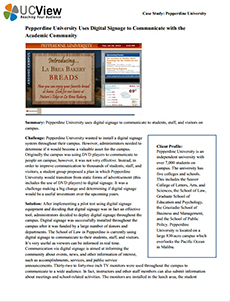 Since 2007, Pepperdine University has been using digital signage to inform and entertain students, staff, faculty, and visitors. 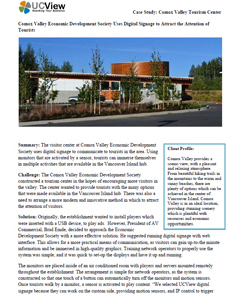 Comox Valley Economic Development Society Uses Digital Signage to Attract the Attention of Tourists The visitor center at Comox Valley Economic Development Society uses digital signage to communicate to tourists in the area. Using monitors that are activated by a sensor, tourists can immerse themselves in multiple activities that are available in the Vancouver Island hub. 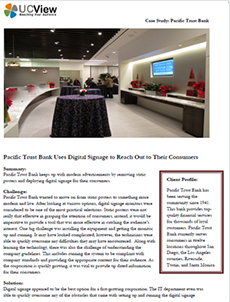 Pacific Trust Bank Uses Digital Signage to Reach Out to Their Consumers Pacific Trust Bank keeps up with modern advertisements by removing static posters and deploying digital signage for their consumers. 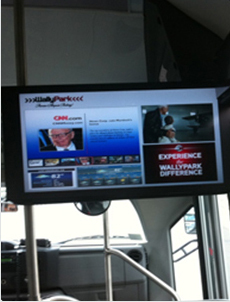 WallyPark Uses GPS Motion Triggered Ads to Communicate to Travelers on the Shuttle WallyPark uses digital signage, which has GPS triggered ads, to communicate to travelers on a shuttle going to and from the airport. 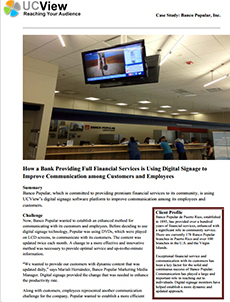 How a Bank Providing Full Financial Services is Using Digital Signage to Improve Communication Among Customers and Employees Banco Popular, a large banking corporation, is using UCView’s digital signage software platform to improve communications among its customers and employees. Seeing the potential in digital signage, Banco Popular has plans to expand it to other branches for superior communication. How A Global Flooring Giant Is Using Digital Signage To Drive Workforce Communications & Plant Efficiency Mohawk Industries, the world’s largest flooring supplier, is using UCView’s digital signage software platform to improve workforce communications and maximize uptime and efficiency on plant floors. Based on employee feedback and cost-savings, what started as a test is now being rolled out globally. One of the biggest Hispanic chains in southern California wanted to install digital signage to uplift the look of ten large department stores in Los Angeles County. The department stores had been using DVD and computers connected to screens, but found this solution limited the number of screens and capability to manage and distribute content from a centralized location. 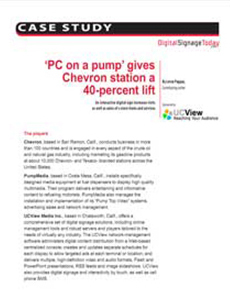 Topics: PC on a pump’ gives Chevron station a 40-percent lift Chevron, based in San Ramon, Calif., conducts business in more than 100 countries and is engaged in every aspect of the crude oil and natural gas industry, including marketing its gasoline products at about 10,000 Chevron- and Texaco- branded stations across the United States. 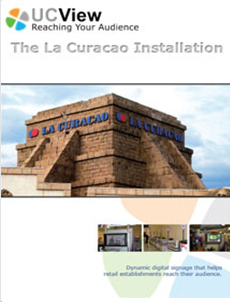 La Curacao is a growing chain of large format department stores, with 10 locations already in operation and 2-3 new stores being added per year. 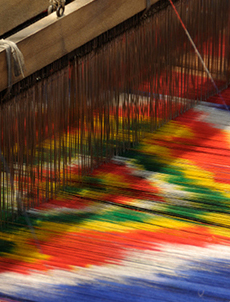 Each retail center is rich with Latin American culture and merchandise, featuring detailed Mayan & Aztec architecture that stands out among urban surroundings and live performances of traditional Latin American music to entertain customers as they shop. 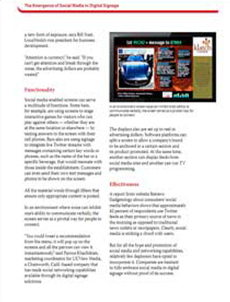 Social media-enabled screens can serve a multitude of functions. Some bars, for example, are using screens to stage interactive games for visitors who can play against others — whether they are at the same location or elsewhere — by texting answers to the screen with their cell phones. Bars also are using signage to integrate live Twitter streams with messages containing certain key words or phrases, such as the name of the bar or a specific beverage, that would resonate with those inside the establishment. Customers can even send their own text messages and photos to be shown on the screen.. In this article we are going to cover the deployment of Live TV content in digital signage. One of the main reasons for creating zones in digital signage is to enable multiple messages from different sources on the same screen. Basically any video input source can to be displayed on the screen with surrounding advertisements or any type of content. The main advantage of using live feed is to entertain your audience with live video content and at the same time engaging this very audience with advertising or other information..